Learn the basics of beginning fusing and slumping glass in this great foundational class. This is a prerequisite for most other fusing classes. 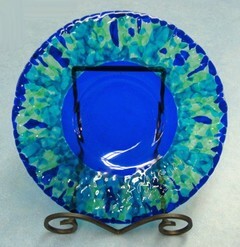 Students will make a fused suncatcher, and a dish or platter. We will cover glass preparation, kiln use, basic fusing theory, slumping and draping, and discuss techniques for making a wide variety of projects such as votive holders, textured plates, wall vases, and working with dichroic glass. Students will learn to work with glass frit, mosaics, shape stringers, and how to prepare molds for slumping. In the second class students will see a kiln demonstration and plan the slumping project, which students will arrange to do on an individual workshop basis. Select from small plate molds to large 14" platters for your second project. 2 weeks (4 hours) plus individual workshop for second project. Class fee includes materials used in class for first project only. Students will need to purchase glass for second project. Experienced glass students should bring cutting tools and safety glasses.